“I see the boat on the lake! She was once known as the Minerve, a proud, 38-gun Armide-class frigate of the French Navy. Like Corona, she had been captured by the British during the Napoleonic Wars. Towed to Plymouth, she was refitted and renamed Alceste, for the queen who would be called upon to die in place of her husband, Admetus, one of Greek mythology’s Argonauts. Perhaps this was an omen. 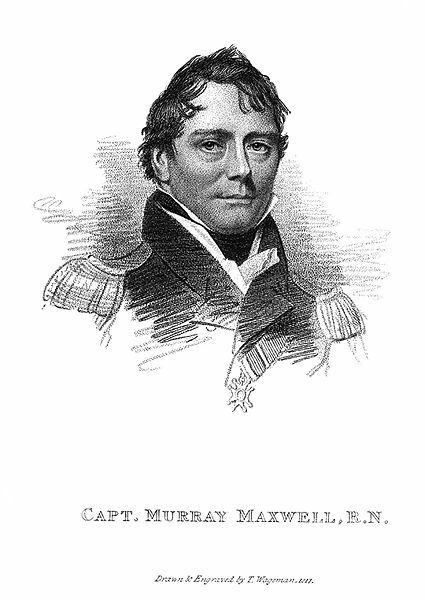 In 1807, before he was to wreck Daedalus, Captain Maxwell was given the command of Alceste. Instructed to go to the Mediterranean, Maxwell and his ship raided Spanish shipping carrying supplies for Napoleon’s armies. Their greatest success came during the Adriatic Campaign when Alceste intercepted a convoy of French frigates. 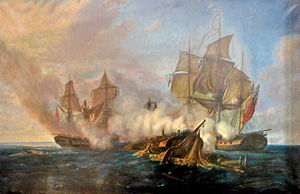 After a heated battle, a large ship Pomone and an accompanying storage vessel carrying 200 cannon surrendered to Maxwell. The ships and cargo were sold for prize money. By 1812, Alceste had made her captain a wealthy man. Who knows what might have been her fate had Maxwell gone down with the Daedalus the next year? But he did not. A court martial proceeding cleared him from all blame for the loss of the former Corona. Captain Maxwell had money, friends–and a second chance with Alceste. Lord Amherst was to go to China and establish relations with its emperor. He chose Captain Maxwell to transport him and his diplomatic mission. The captain was given command of Alceste once again. Unfortunately, Amherst’s mission was doomed to failure. As an Englishman, he had opposed one emperor in Europe and saw no reason to kowtow to another, refusing to offer tribute as to an overlord. With this parting shot, the Alceste set sail for England. The last peril she had to pass was the Gaspar Strait. This entry was posted in Regency, Uncategorized and tagged Active, Admetus, Alceste, Alcestis, Argonauts, Captain Maxwell Murray, China, Daedalus, Euripides, Gaspar Strait, Greek mythology, Lord Amherst, Minerve, Napoleon, Pearl River, Pomone by Angelyn. Bookmark the permalink. Ummmm. Very interesting story….. So much can be gathered from it…. And I love the quote from Euripides, too. Good post. I loved that quote as well. It seems appropriate for this particular ship–she finds the ferryman of the dead come in many guises and usually his hand is on the tiller.